Chip Conley was born in Orange, California. He graduated from the PACE program at Long Beach Polytechnic High School, received his BA in 1982, an MBA in 1984 from Stanford University and holds an honorary doctorate from Saybrook University. An American hotelier, hospitality entrepreneur, author, and speaker, Chip founded Joie de Vivre Hospitality in 1987 at age 26, holding the position of CEO for nearly 24 years. In 2010, after having created and managed 50 boutique hotels mostly in California, Conley sold his company to Geolo Capital. Chip was a speaker at the annual TED conference in 2010 on creating a business model driven by our need for meaning, as outlined by Abraham Maslow’s hierarchy of needs and as presented in his book, Peak: How Great Companies Get their Mojo from Maslow. His other books include, The Rebel Rules: Daring to Be Yourself in Business; Marketing that Matters: 10 Practices to Profit Your Business and Change the World; and Emotional Equations: Simple Truths for Creating Happiness + Success in Business + in Life. In 2013, Chip became Head of Global Hospitality and Strategy for Airbnb. and founded Fest300. At Airbnb, he was asked by the three young founders to help evolve the company into a hospitality company with more than one million hosts in 191 countries. Chip had never worked in a tech company, was twice the age of the average employee, and was reporting to (and mentoring) CEO Brian Chesky who was 21 years younger than he was. He worked closely with Brian as a mentor and helped to build a bridge to the travel, hotel, and real estate/development/landlord industries. He also conceived and led the annual Airbnb Open, the company’s iconic hospitality festival conference. In 2017, he transitioned to the role of Strategic Advisor for Hospitality and Leadership. Chip is founder of San Francisco’s annual Celebrity Pool Toss fundraiser, which has raised millions for inner city families in San Francisco’s Tenderloin District. He created the annual Hotel Hero Awards that celebrate line-level hospitality staff for the work they do daily. He served on the Glide Memorial Board for nearly a decade and is now on the Boards of the Burning Man Project and the Esalen Institute. 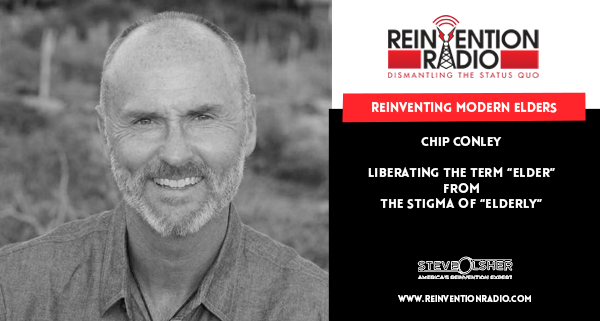 Tune in to hear Chip chat with Steve, Mary, and Richard about modern elders and liberating the term “elder” from the stigma of “elderly”. What happened when he lost his creativity? Reinventing Bare Feet – In this episode, tune in to hear Steven Sashen chat with Steve, Mary, and Richard about why doing what’s NATURAL is best and how we’ve merely been hypnotized by marketing when it comes to feet and footwear.